THREE GREAT THRILLERS! ONE LOW PRICE! Three full-length thrillers with a combined total of +4,000 reviews averaging +4.5 stars. $1.99 for a limited time - 80% off the regular price. Don’t miss this great opportunity to meet Tom Dugan, a globe-trotting, wise-cracking marine consultant and very reluctant part-time CIA asset. 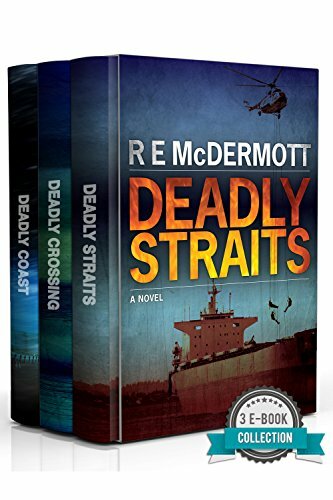 Deadly Straits - Clancy fans will love this taut, action-packed thriller. A cabal of terrorists engineers not one act of terror, but three, and part-time spook turned CIA scapegoat Tom Dugan is the only one with a clue. But his CIA handlers won’t listen; they’re too busy trying to kill him. Deadly Coast - Cussler fans will love this fast-paced adventure, featuring modern day pirates with terrorist links and a fortune in sunken treasure. Dugan and his ragtag little band of volunteers find themselves the last line of defense between the world and a terrifying bio-weapon. Deadly Crossing - Human trafficking is all around us, but when it touches those close to Dugan, he delivers his own style of justice. If you liked TAKEN, you’ll love this book.